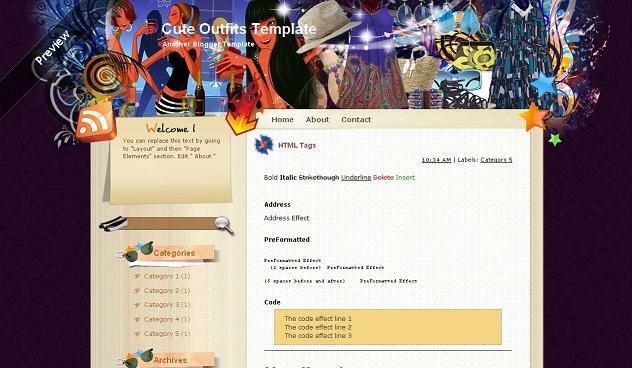 Cute Outfits Blogger template is two column blogger template with sidebar to its left and post section to its right.The theme is very beautiful and you would be going to like it for sure.Many widgets have been built inside it.Like social bookmarking icons are ready below the posts and rss button for the blog also ready at left of header.Also have an small welcome section at top of sidebar to write about your blog or yourself above sidebar in layout.Seo for tile has already been done for you.Top menu links are also ready for you.Search bar is also at top of sidebar ready for you to use. Other blogger templates you may like are Marioland and Insignia. @jonha no it will not show up my photo. Thanks for the great things that you are doing. I am having problems with my header and the slider, like they overlap a bit. Could you possibly do to my blog and see how I could fix it? It's the jonhappiness(dot)blogspot(dot)com. Thanks so much! @un its not the place to add to have that big header u have to do many chnages in header design for it.